In November 1966, Yoko Ono debuted her art piece, Apple at her exhibit titled Unfinished Paintings and Objects at London’s Indica gallery. This was where Beatle John Lennon first encountered the Japanese artist and her work in November 1966. He thought that the bright green Granny Smith apple on a plexiglas pedestal with its asking price of £200 was “pretty funny”, and proceeded to take a bite prior to the show’s opening the next day. This modern tale of Adam and Eve began the ballad of John and Yoko, leading to a wider world view of Ono’s art. It also began the turbulent, yet exciting years for the infamous couple who would dedicate their eternal union to promoting peace. 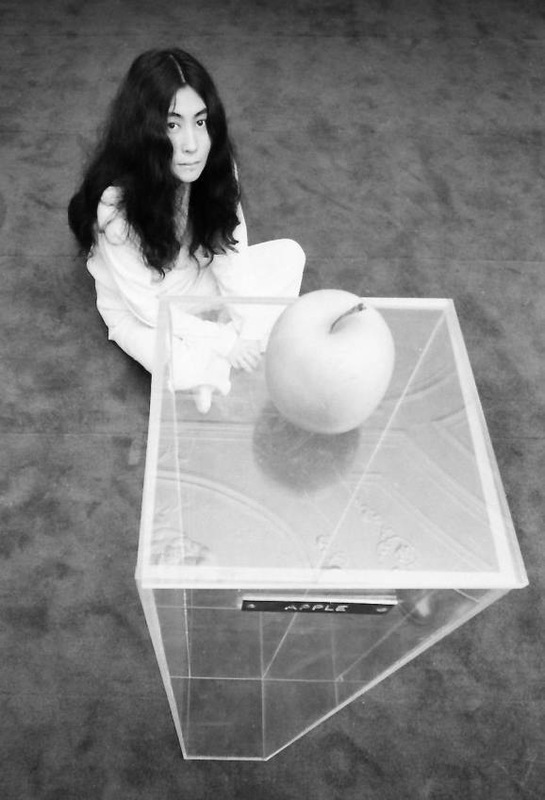 Yoko was not only presenting nature’s perfect creation, the apple on a pedestal. She was also – unwittingly – an avant-garde Johnny Appleseed leaving a trail of seeds, using nature to nurture conceptual art via the forbidden fruit. (Her art also assimilated many other elements of nature; sky, wind, water, air…the whole universe!) In her collaboration with nature, Yoko presents an apple’s beauty and transience as it decays – life as art, art as life. In religion and in mythology, the apple is associated with love, sensuality, sin and temptation. For what became John and Yoko’s Acorn Event (1968) at Coventry Church, Yoko had originally planned to bury an apple so that a tree would grow, but John suggested planting acorns facing east and west instead (signifying their union). 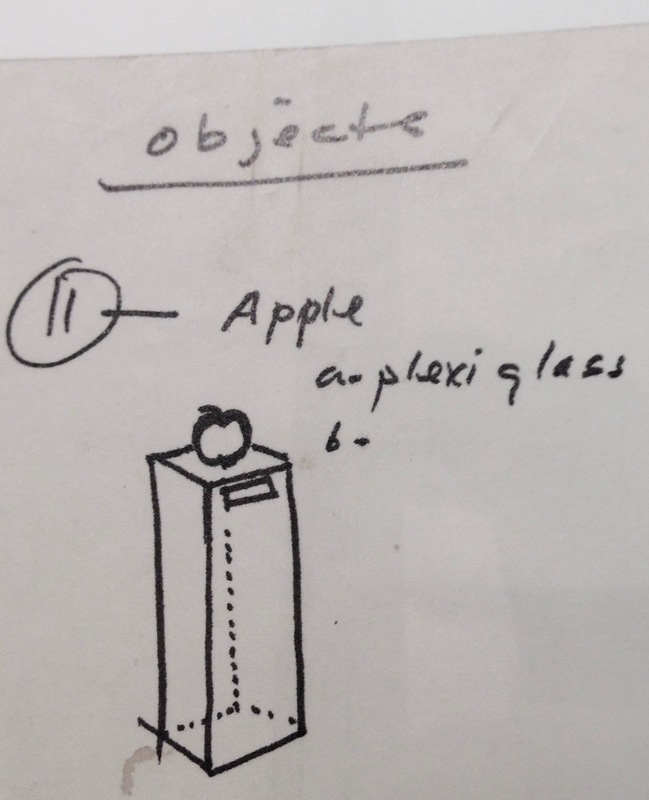 “When it deteriorates and disappears, the pedestal with the ‘APPLE’ plaque will just be left there like a tombstone.” Y.O. The Beatles’ Apple Records label was, launched in the summer of 1968. The apple logo was first used on the single ‘Hey Jude’/’Revolution’. The name of the painting is actually ‘Le jeu de mourre’ (The Game of Mora). In René Magritte – Catalogue Raisonné (1993), it is listed as number 1051 and situated late in the artist’s life, in 1966. As Paul still owns the original painting, only a black and white photograph is available to the public. A colorized version has been re-created. René Magritte passed away in 1967 at age 68. Apple in 3 phases: Whole, Bitten, Decomposed.